Most mail clients allow access to the message header. The following list contains a few popular mail and web mail clients. Please refer to the manual of your mail client if your mail client is not included in this list. Login to your account on the webpage and open the message (click on it). Click on the "down-arrow" on the top-right of the message and select "Show Original". Now you will see the complete message source. Login to your account on the webpage and open the message (click on it). Click on "Actions" and select "View Full Header". Login to your account on the webpage and go to the message list. Right-click on the message and select "View Message Source". Open the message in MS Outlook. Now go to "View" and select "Message Options" - or "File" -> "Info" -> "Properties". Open the message, then click on "View" and select "Message Source". Select the message in the list, right-click on it and select "Properties" and go to "Details. 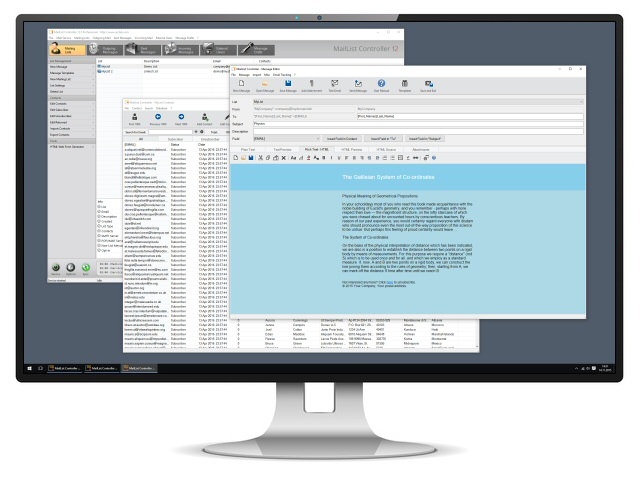 Arclab® MailList Controller is the complete solution for newsletter mailings and email marketing campaigns. Test drive MailList Controller for Windows or use the free version as long as you want. Return Path: The email address which should be used for bounces. The From: line, which contains the sender of the message could be faked easily, so you should not rely on this information. The lines in green contain the routing information, from the senders computer to the recipients mail server. (3) The message was sent from the senders computer with the IP address aaa.aaa.aaa.aaa to the mail server of the sender. In many cases the sender IP aaa.aaa.aaa.aaa is a dynamic IP address, e.g. DSL. The IP address gives many information about the sender, the location of the sender and the provider. (2) The message was transferd from the senders mail server with the IP address bbb.bbb.bbb.bbb to the recipients mail-exchanger. The mail-exchanger is the mail server, which accepts incoming messages for a domain. (1) The message was finally received by the recipients mail server from the the recipients mail exchanger ccc.ccc.ccc.ccc. This is only a sample, which should show the principles. The message routing can contain much more steps, depending on the used mail provider. It should always be possible to see the sender computer IP address aaa.aaa.aaa.aaa and the sender mail server bbb.bbb.bbb.bbb, if the message was sent from a mail client and a client computer. If the message was sent from a webmail client, then the real IP address of the sender is not included - in this case aaa.aaa.aaa.aaa (if any) will be the IP address of the webmail. Some might try to fake the routing information, but your mail server should give you a warning that something is not correct during the transfer from the sender mail server bbb.bbb.bbb.bbb to the recipient mail exchanger ccc.ccc.ccc.ccc. The Sender Policy Framework SPF is a framework to prevent sender address forgery. "SPF is used to describe what mail server is allowed to send messages for a domain". It's used to avoid fake email addresses (as sender email address). The system can detect if the mail server, which wants to send a message to the recipients mail-exchanger, is valid for the senders email address (domain). The message should be rejected by the recipient's mail exchanger. "Some organization (domain) has signed the message and is responsible for it". It's a good indicator, that the message is NOT a spam message. No spammer would "sign" a message. SpamAssassin is a anti-spam software, which is installed on many mail server. It's a great tool, which gives a detailed report for each message by adding lines and a summary to the message header. A X-Spam-Score <5 means (on most systems) no spam, >5 probably spam and >15 spam. Spam might get deleted immediately or moved to the junk mail folder. Some systems add [SPAM] to the subject, so that these messages could be moved to the junk folder in the mail client using a rule. This sample shows a clean message, with a negative spam rating! It includes a SPF-pass and the message is DKIM signed. SpamAssasin does not only check the message sender, it also checks the format and the content of the message. This message has a horrible spam-rating of 34.7. It's definitely a spam message. It was received via a relay (mail server), listed on a blacklist. As you can see, the rules have different scores (spam rating), e.g. HTML_MESSAGE has only 0.1, because any rich-text (html) message would match this rule. HTML_IMAGE_ONLY_08 has a higher score of 2.4, because it indicates an "image message", where the sender tries to avoid the content filter by using an image instead of text.